Some people take one look at Native American artist Bobby Wilson's long, braided hair and start treating him like he just stepped out of a 19th-century Edward Curtis photo. "People act like I don't keep up with the times," said Wilson, of Minneapolis. "They want to tell me about a sweat lodge they went to once or they got to see a powwow one time and it was so beautiful. And you can't shake people who are romantic about Indians from being romantic about Indians." The term American Indian art often evokes images of beads and buckskin — and that can be a challenge for contemporary American Indian artists, whose work has nothing to do with quills or birch bark. "[People's assumptions are] always going to be the beautiful culture or the peaceful, loving Indians who are stewards of the land," he said. "Whatever." Whatever the notion, said Wilson, it gets in the way of reality. And that can be a major challenge for the 27-year-old American Indian artist. Wilson has many sides. He's a graphic designer who excels at spoken-word poetry. He's a graffiti artist known for sporting neckties. He's an educator with a tattoo across his Adam's apple. "I'm a Sisseton-Wahpeton Dakota in Minneapolis, Minnesota," Wilson said, leaning on the rhyme. People often expect feathers and animal hides when they look at his work. Wilson gives them aluminum and spray paint. "I've actually had people tell me that it wasn't Indian art because it's contemporary," said Wilson. "If this was beaded, then it would be Indian art? But if it's painted or sawed or whatever, it's not?" That tension between traditional and contemporary is the focus of the current exhibit at the All My Relations Gallery in Minneapolis. "Native arts are still often really relegated to the past, frozen in a particular place in time," said Dyani Renyolds-White Hawk, who curated the show. Renyolds-White Hawk appreciates seeing American Indian artwork in historical museums. She'd just like to see it in modern galleries as well. "There is a lot of expectation outside of Native communities, and even within Native communities, for Native artists' art to look Native," she said. "Our goal with this exhibit is to really expand the definition of what is traditional Native arts." At the gallery, moose hide mixes with Italian silk. And a series of bandolier bags leads to a sculpture made out of skateboards. That last one is Wilson's contribution. Wilson crafted brightly colored skateboards and splayed them against the wall. From a distance, they resemble a fan of feathers. "It's just five skateboards put together," Wilson said. "But when you come to an Indian show and you have a preconceived notion of what the art is, then they're feathers or a headdress or something. I just love that idea." 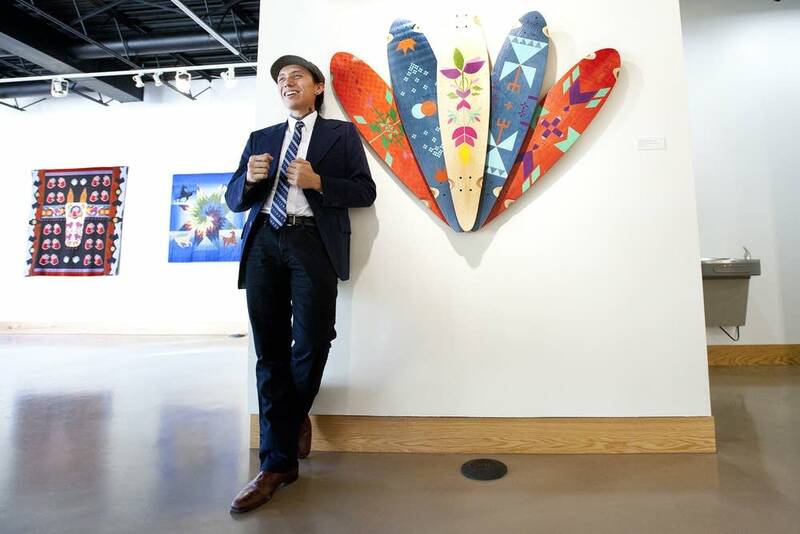 Wilson said it's vital for Native art to make its way into contemporary galleries. But he's dedicated to keeping it outside their walls as well. 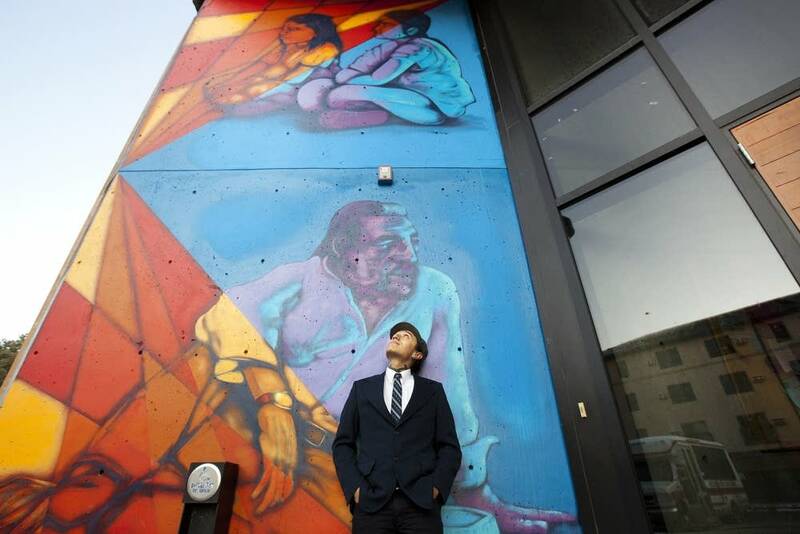 For years, Wilson's been designing public murals. His work can be seen all along Franklin Avenue in Minneapolis. 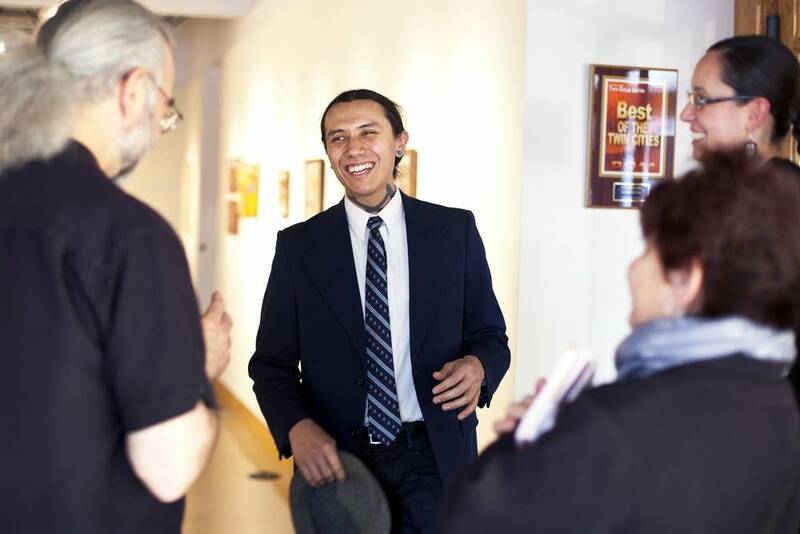 "Most of the people in the American Indian community are not actually going to go to a gallery," said Wilson as he walked along Franklin Avenue in Minneapolis to look at some of his work. "What I am trying to do is display some of my work that they can identify with and in the places I know they're going to go." Cars rumble by as he points to one piece. "It's so gratifying to hear other Indian people, as they walk by, say, 'Man, that looks good, bro,' " he said. Wilson's ancestors painted on buffalo hides. He prefers the sides of buildings. But being a contemporary artist doesn't mean abandoning tradition completely. 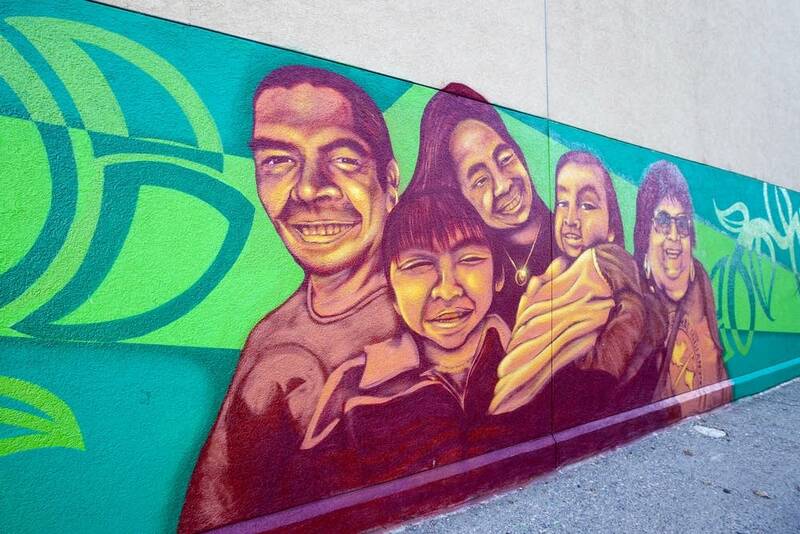 "The borders of this mural are playing with the design motifs that you would find within the Ojibwe and Dakota community," he said, referring to a Franklin Avenue mural. Within those borders, Wilson painted portraits of local community leaders. He added images of his niece and nephew alongside. All of them are smiling. He said that's something you rarely see American Indians doing in those old sepia-toned photographs.